PA Elder, Estate & Fiduciary Law Blog: Top Ten Reasons to Join "Wills for Heroes"
Top Ten Reasons to Join "Wills for Heroes"
I write this blog entry on a Saturday morning at the Widener University School of Law (Harrisburg Campus) during a "Wills for Heroes" session, which offers free wills and other estate planning documents to first responders and their spouses or domestic partners. Document preparation is accomplished by volunteer lawyers using custom-designed legal drafting software. Client execution of documents occurs before volunteer notaries and law student witnesses. Conduct of the entire process is guided by experienced staff. This session is co-sponsored by the Dauphin County Bar Association and the Pennsylvania Bar Association, Young Lawyer's Division, and is supported by some benefactor organizations. See: Brochure, Wills for Heroes Pennsylvania (PDF, 2 pages). I followed this program for many years, but only became involved personally in 2011. 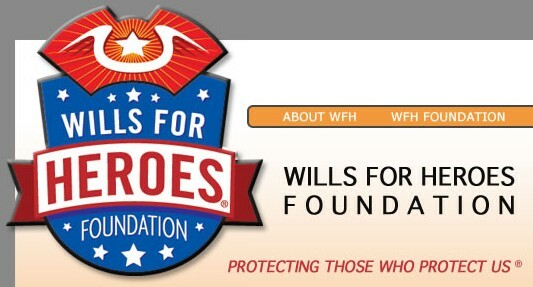 See: PA Bar Promotes "Wills for Heroes" Further (07/18/11); "Wills for Heroes" Workshops Multiply in PA & DE (08/03/10); PBA's Young Lawyers Sponsor "Wills for Heroes" (05/06/09); and Firefighters, First Responders, and Free Wills (05/15/08). This is the second such event that I attended at WLS-Harrisburg. I participated in a similar, but much larger and longer session held here on a Saturday in mid-November, 2011. I served as an "expert" on demand, discussing specific concerns or offering document solutions. Those five pro bono hours were shared with experienced local lawyers, enthusiastic second- and third-year law students, and efficient notaries -- all volunteers. Our activities were organized by PBA staff. Each participant was devoted to producing a set of individualized last wills, durable powers of attorney, and health care directives to worthy non-paying clients -- first responders and their life mates. The first responder clientele had qualified for such pro bono legal services as firefighters, police officers, paramedics, corrections personnel, or probation officers, employed by or volunteering through a federal, state, or local government, or their related agencies and public service associations. Most first responders brought a spouse. Some even brought their young children, who played with toys in a special area. The first responders had attended an orientation session or had received an explanation package previously. The objectives, benefits, and limitations of the program were explained. An estate planning questionnaire was distributed for their completion in advance of their scheduled interview at the session. Most had completed that questionnaire; but some arrived sheepishly in hopes of completing a blank one during their interview with a lawyer. Either way was okay. The process proceeded past sign-in, into a personal, confidential interview with a lawyer seated with a portable computer at a "station". The lawyer then entered data from the questionnaire -- supplemented by responses during the interview -- into document assembly software specifically designed for the WFH program. Special concerns could be addressed, within limits. Next, document drafts were printed, reviewed by the lawyer and clients, and revised if necessary. Final documents, together with a representation letter (as to limited engagement and then termination of that professional relationship) and a post-execution instruction letter, were produced on laser printers. The clients carried their document packages to a square table that appeared to host a bridge game looking for a fourth player. The notary and two witnesses proceeded through the signing formalities with the clients. An hour or so after signing in, the clients left with free, personalized, dependable estate and personal planning documents resulting from their intentional planning with professional implementation. The benefits to the first providers are unquestionable and valuable. But what are the benefits to the other participants -- the volunteer legal services providers? #10: You can join hundreds of lawyers in many states who have participated in this program since 2001. #9: You can eat free food -- donuts and coffee for breakfast, or soft pretzels, pizza, and soda for lunch -- depending upon your shift. #8: For lawyers, you can meet yourself years ago as a law student, or, for law students, you can meet yourself years from now as a lawyer, and then interact with your doppelgänger. #7: You can get your name/face in a newsletter or newspaper, or perhaps even on television -- but only if you sign the media consent form -- since such sessions often become local news. #6: You can brush up on estate planning law during the one-hour participants' orientation session offered before clients arrive. #5: You can learn about document assembly software, which is checklist-oriented and data-entry based, but which transfers a set of documents into standard word processing software. #4: You can hone your people skills in a safe and supervised environment. #3: For lawyers, you can obtain pro bono service credit and recognition. #2: You can meet some special, dedicated people -- the first responders -- as short-term clients. and the best reason to volunteer at a Wills for Heroes session in your area -- particularly one sponsored by the Pennsylvania Bar Association -- is . . .
#1: You can help first responders, who already work daily to help all of us. I noticed that the Wills for Heroes website linked to this post in its "News" section. I'm pleased to be a part of their promotion of this worthwhile Program.